يقع فندق Garden Court Suites & Apartments في منطقة تتمتع بمعالم كثيرة، وتعتبر المكان الأنسب لاكتشاف هذه المدينة رائعة الجمال و ما يحيطها. يمكن من هنا للضيوف الاستمتاع بسهولة الوصول إلى كل ما تقدمه هذه المدينة النابضة بالحياة. إن سهولة الوصول من الفندق إلى المعالم السياحية الشهيرة الكثيرة في المدينة هو استثنائي بحد ذاته. إن الخدمات التي يقدمها Garden Court Suites & Apartments تضمن للنزلاء إقامة مريحة. لضمان راحة ضيوفه، يقدم الفندق الخدمات التالية: واي فاي مجاني في جميع الغرف, مرافق مخصصة لذوي الاحتياجات الخاصة, تخزين الأمتعة, واي فاي في المناطق العامة, صف السيارات . في الفندق غرف نوم يتجاوز عددها 54، كلها مجهزة بعناية وجمال وبعضها مزود بـ تلفزيون بشاشة مسطحة, حوض الاسترخاء, غرف لغير المدخنين, مكيف هواء, تدفئة. صممت خدمات الاستجمام في الفندق والتي تتضمن حوض استحمام ساخن, مسار جولف - ضمن 3 كم, حديقة لمساعدتك على الاسترخاء والراحة. إن Garden Court Suites & Apartments هو خيارك لخدمة الفنادق الراقية في المدينة. We loved our two floor apartment. Everything is done by a very high standard. The apartment has an extra toilet upstairs which is very convenient. The hotel is very close to the centre but very quiet. Very friendly staff. Room located on busy street...like staying in a big city with traffic passing by well into the night. Also many stairs to get to this suite. Suitcases could be a problem for less fit individuals. ( we are in mid 60’s and mid 70’s). Room itself was fabulous and a short walk into town. Was impressed by the size of the room, cleanliness and how modern it all was. Close enough to the main town as well. Will be staying again! Very comfortable and convenient to walk into main centre. Nice apartment for holiday. Recommend for group of friends going for holiday. Nice spacious apartment with all the amenities. Friendly staff. 10 mins walk from town. Reserved parking in the basement. My favorite place but it was fully booked so our stay was cut short, my fault as I didn't count the days correctly. The room was big with a nice bathroom. Clean room with kitchen. Spotless clean and comfortable room. Great location about 10 min walk to town, however be aware that it's a steep climb. Fast wifi. Friendly service, would stay again. FYI some great views from the park next door to the hotel. This was a last minute booking for me and was a bit worried as Queenstown was booked out except for this place, and was wondering why. Didn't need to be, as found this place perfect for what I wanted. Only a short walk into the main hub of town (although the walk back is steep, but was heading off to do the Routeburn, so wasn't a problem). On the main road out to Airport and there is a bus stop right out the front, which is very handy. Quite, clean and comfortable! Well worth it! Heated bathroom. Very centralized location. Walking distance to town center. Clean room. Friendly staff. Awesome! My sister, my elderly father and myself stayed 2 separate nights in two different 2 bedroom apartments (215 and 217). In between the two nights we went on an overnight cruise on Doubtful Sound and the staff looked after our suitcases very well. The view from 217 is far superior as it is on the end of the building and the extra windows make that apartment lighter, brighter and more welcoming. The location of the apartments is excellent with only a pleasant 10 minute walk into the centre of Queenstown (although it is quite steep). The 2 bedroom apartments are quite well appointed, although the TV in 217 is very small (due to its placement). But since we rarely watched the TV it was not a major issue. There were some maintenance issues with the kitchen cupboards and fridge, but these are caused due to poor design rather than poor cleaning. The beds were comfy and the bathrooms good. 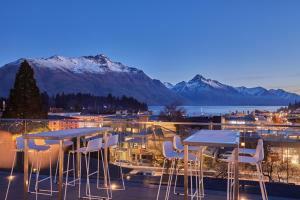 Staff were very friendly and helpful and knowledgeable about Queenstown. Overall an excellent place to stay and I would recommend it.